Hi, I’m Ashleigh, a Northumbria University student on a year-long Delivery Manager placement within the digital team here at the NHSBSA. I joined in September of this year and since then, I have been working with the project team on the Maternity Exemption (MatEx) digital pilot project. The NHS offers free NHS prescriptions to women who are pregnant, or have given birth within the last 12 months. This process involves a paper application form that must be completed and posted to us here at the NHSBSA. Once received, a plastic card is sent to the mother. The MatEx project was designed to digitise this process, making it quicker and easier for healthcare professionals to complete. The current process allows the healthcare professional to complete the entire application on behalf of the mother, who then gets an email containing the certificate immediately. The MatEx project started in November 2015. The service went live and the first applications were received in January 2017. Since then it has grown with nearly 1,300 users on the system and 11,427 digital applications made so far. Midwives have also given us excellent feedback on their experiences. The original version of the service involved the healthcare professional completing part of the online application and then the mother completing the rest. Now, our service is fully completed by the healthcare professional and the mother receives her exemption certificate immediately by email. More and more healthcare professionals are joining the pilot project every day and we are now looking to open the service to an even wider audience. Our team motto is ‘continuous improvement’ which in real terms, means we are listening to the users feedback and iterating the service to ensure they it is as quick and easy as it can be. What are the benefits of the digital project? Our service not only benefits the mothers who receive the exemption certificate, but also the healthcare professional that completes the online form for them (much quicker to complete than the paper). It also negates the issues that arose with our original service in terms of mothers with language and literacy barriers who struggled to complete the application. It can take up to two weeks for patients to receive a certificate through the post once the form has been processed and many women will wait for it to arrive before getting the medication they need. Through our service, the certificate is emailed immediately to the mother, meaning she can have instant access to free prescriptions. Mothers do not have to complete any of the application, saving their time. This prevents them from forgetting to do this and on some occasions, receiving a penalty charge notice after claiming free healthcare (thinking they were automatically exempt). Lastly, it is helping to reduce the use of materials such as paper and plastic, which we send out with the paper forms. Ultimately, this is working towards saving the environment. 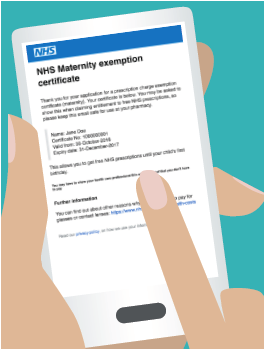 The digital maternity exemption service hopes to make healthcare professionals’ jobs easier, and allow mothers to get their certificate quicker. By being cost-effective for the NHS and very user friendly, we hope this service will eventually become the go-to facility for a healthcare professional to apply for a MatEx certificate on behalf of mothers. I am extremely proud to be part of this project. Alternatively, please contact NHSBSA.digital@nhs.net if you have any questions or would like to learn more.